The HAPI Slim Drum weighs in at only 7 pounds. 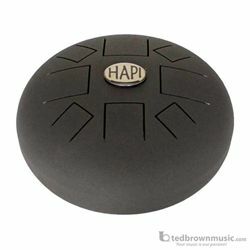 The height has also been reduced to 6 inches tall and it's still a popular 12 inches wide, the same playing surface area as the HAPI Drum Origin. This makes the SLIM our most portable and easy to carry drum. You won't think twice about taking your drum with you. It looks sleek and you can even grab it with one hand. Surprisingly for its smaller size, it has a powerful and full bodied sound. The Slim comes in a variety of new scale choices, made possible because of its new smaller resonating chamber, and is only available in black which goes with everything!